No Admission! ..Bring the whole family! An AUTHENTIC Chuck Wagon Cook-off with celebrity guests! As well as a BBQ Supper, Live Music and Vendors! Boots, barbecue and biddin’ are in the mix as reservations pour in for the ninth annual Gala weekend planned by the Friends of Fort Griffin for Oct. 12 and 13. An added feature this year is the Western Trail Chuck Wagon Reunion, including the authentic chuck wagon cook off that will take place during the day Friday at Dr. Shackelford’s Paradise Park adjacent to the Bank Park on Main Street. “At noon, each cook, along with one assistant, will receive a draw bag of meat. Included might be venison, buffalo, veal, quail, dove or wild hog, each something that would have been typical for the chuck wagon period in history,” said Gala & Cook off coordinator Susan Waller. Trail food judging begins at 6:00 p.m. on Friday. The cook off will be judged according to blind judging standards, with numbered plates. The Grand Prize winner will be announced on Saturday at the Gala, with each competing team presented a bronze medallion to commemorate the reunion cook off. A barbecue dinner cooked by Cliff Teinert and Bill Cauble will be served from 5:00-7:30 p.m. on Friday night at the Bank Park after the homecoming parade and before the Albany High School homecoming game. Cost for the dinner is $10 for adults and $8 for children 12 and under. Free musical entertainment well enhance the BBQ dinner. Saturday morning a chuck wagon breakfast will be available at the Bank Park downtown. “Saturday night will be a fantastic evening of fine food, drinks and dancing, and of course, the auctions,” Waller commented. The gala begins at 6:30 p.m. with drinks, raffles and a silent auction. Bill Cauble’s prime rib dinner will be served beginning at 7:00 p.m. at the Jackson Warehouse and Agarita Gardens. Winners of the celebrity cook-off will be announced at that time. 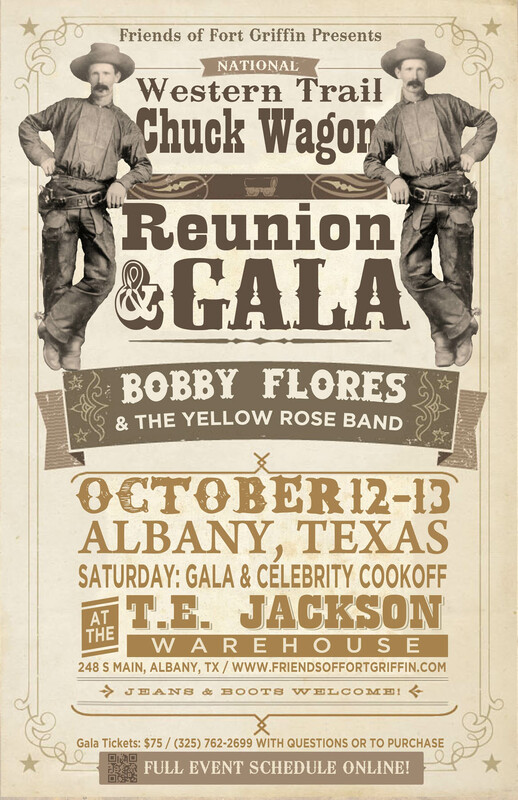 Music for the dance is provided by Bobby Flores and the Yellow Rose Band, a classic country and western swing band featuring three fiddles, steel guitar, and Grammy award winning Bobby Flores’ country vocals. From Bob Wills to Ray Price to Merle Haggard, dancers can expect traditional country music. Anyone 21 years and older is invited to the Gala. Attendees do not have to receive an invitation to attend, but they will need to make a reservation, Waller said. Tickets are $75. Cutoff date for reservations is Tuesday, Oct. 9. Invitations have been mailed, but we want everyone involved,” she added. “If you didn’t receive an invitation, just call me and we’ll get you one,” Waller said. “We are so pleased to add the cook-offs to the activities this year,” Waller added. 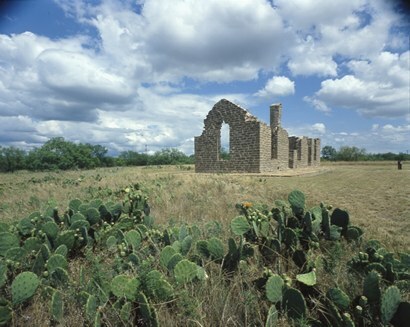 As in previous years, proceeds from the 2012 event will be earmarked to help rebuild and restore buildings at Fort Griffin State Historic Site.